For residents of the small town of Lypovets, the Vinnytsia region, Maksym Bevza is a true legend. He is an example for his former school’s students, and his successes are passed down to each successive class. The lad showed brilliant results in the External Independent Evaluation (EIE), having scored 200 points in physics and mathematics and 194 in the Ukrainian language. Knowledge opened up fantastic opportunities to him. 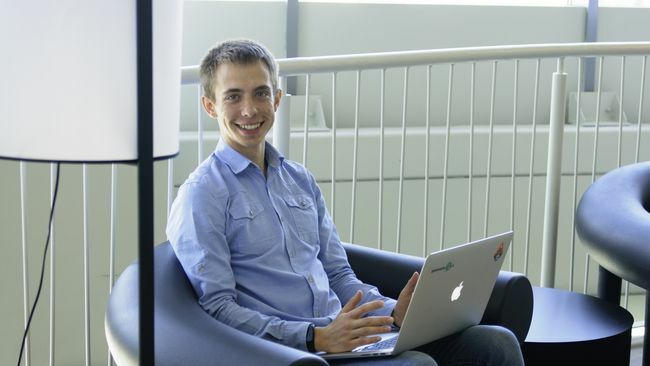 He chose to study at one of the most prestigious universities and became a highly sought-after employee for the best IT companies in the world. However, after a few internships abroad, Bevza returned to Ukraine. Now, he says, he has a dream job that allows him to combine science and the IT, and most importantly, achieve complete self-fulfillment. “At school I was actively involved in the science Olympiad movement, participated in competitions at different le­vels on several occasions. When attending grade 11, I won the first place in computer science, physics, and astronomy, the second one in mathematics, and the third one in economics. That is, I held five prize positions at the regional Olympiads. It was my father who instilled in me the love for the exact sciences, as he is a physicist by training and has had programming as a hobby throughout his life. It was he who started to train me when I was 10, and I entered my first Olympiad in computer science before I studied it at school. I do not remember if I won a prize position then, but it captivated me. Therefore, it is my dad who gave me an impetus to start programming, although now I have already overtaken him by a large margin,” Bevza told us with a smile. After finishing school and receiving brilliant results at the EIE, Bevza had every Ukrainian university offering a place to him. He chose the one that he had long dreamed about – Taras Shevchenko National University of Kyiv. He admits that had he not worked to improve his marks and win the Olympiads, he would have had no realistic chance to enter the university, since admissions were insanely competitive. After graduating with a master’s degree, Bevza has found a job that allows him to combine science and the IT. He works for a Ukrainian company that develops innovative IT products in the field of artificial intelligence and machine learning. Bevza himself works on improving a globally popular service for checking English spelling, in other words, he creates algorithms that prevent us from making mistakes when writing in English. The company is founded by Ukrainians, conditions and compensation are as good as beyond the ocean. Bevza says that the comfort of employees and creative freedom are the top priorities there: they can work or sing, whatever suits them best. The main thing is to believe in what you do, then you will work in good faith and comply with deadlines.